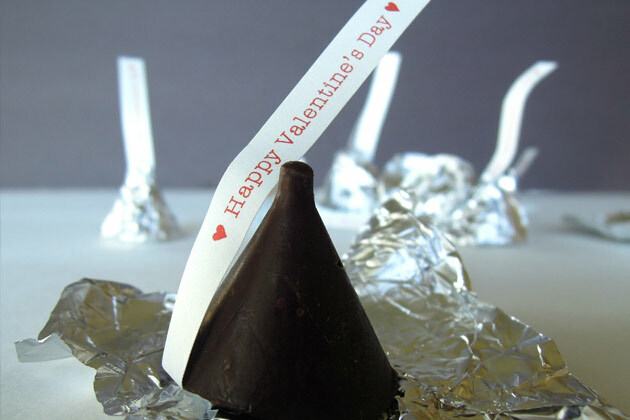 Give your sweetheart the gift of allergen free smooches for Valentine’s Day! Melt the chocolate chips in a double broiler or in a large metal bowl over top a saucepan filled with water to touch the bottom of the bowl. Alternatively, place the chocolate in a microwave safe bowl and microwave at 30 second increments. Stirring at each stop. This should take about 90 seconds total. Fill the funnel half way with melted chocolate, making sure the chocolate fills a little into the narrowest part. Place almond in middle, making sure that the chocolate is covering it entirely. Standing upright, freeze for 10 minutes. 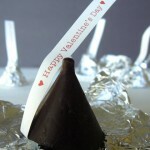 Remove smooches from funnel by gently squeezing the chocolate mold out. This should easily slip out. If not, freeze for another minute. After you cut out Happy Valentine’s Day paper strips (I printed mine out from the computer at size 8 Typewriter font), fold 1/4? inch of the paper under the smooch, making it stand upright. Proceed to wrap with silver candy foil (you will need to cut the wrap to fit each individual kiss). To plug the end of the funnel so the chocolate wont spill out – rip off a small piece of plastic wrap, roll it into a ball and place it inside the funnel, then take the end of a meat thermometer (whatever pointy thing you have on hand) and push it into the neck of the funnel. Don’t push it too hard or you’ll have a very pointy tip!